Mark Bridge’s looping header against his former side took the Wanderers back into the top 4. Off the back of a fine run of form – four wins in five games – it was unsurprising that Gary van Egmond made only two enforced changes, with Jacob Pepper and James Brown replacing Scott Neville and Nathan Burns (who both went off with injury against Melbourne Victory last week) at right-back and left-wing respectively. Tony Popovic was still without Tomi Juric, so Labinot Haliti again lead the line. Shinji Ono’s return to the starting line-up, in place of Iacopo La Rocca, was therefore the only change from last week’s disappointing 1-1 draw with Melbourne Heart. This wasn’t a game high on technical quality, and in truth there was little progression in the tactical battle – but there was a good intensity and tempo to the match. Initially, the home side started very strongly, with Western Sydney struggling to get a touch of the ball and the Jets moving forward purposefully in possession. The format of their midfield was key – with Ben Kantarovski sitting behind Josh Brillante and Ruben Zadkovich, he was constantly in a position to clean up loose balls in a position between the lines, with his ‘mopping up’ helping to sustain pressure. It also freed up the other two in the midfield triangle to move forward and press Aaron Mooy and Mateo Poljak, so that the Wanderers midfield had very little time on the ball and were forced into rushed long balls. Kantarovski also helped start passing moves with his movement into the back line to create a back three, with Kew Jailiens and Taylor Regan splitting wide, and the full-backs pushing high up the pitch. The Wanderers seem to have particular problems when pressing against this sort of setup – against the Mariners, in particular, the extra man in a deep position always draws Youssouf Hersi inside, leaving the left full-back free to receive a pass – and it was a similar sort of situation here, with Scott Gallaway often free when the Jets had possession and frequently carrying the ball forward in the opening twenty minutes. In their strong opening spell, the Jets had two main routes of attack, both stemming from Adam Taggart’s movement between the lines to link up play before spinning forward to either get on the end of crosses, or to invite midfield runners into the space beyond him. Ruben Zadkovich had a good chance when Taggart’s clever close control on the edge of the area led to the midfielder being free for a low shot inside the penalty area that unfortunately lacked the power to beat Ante Covic. 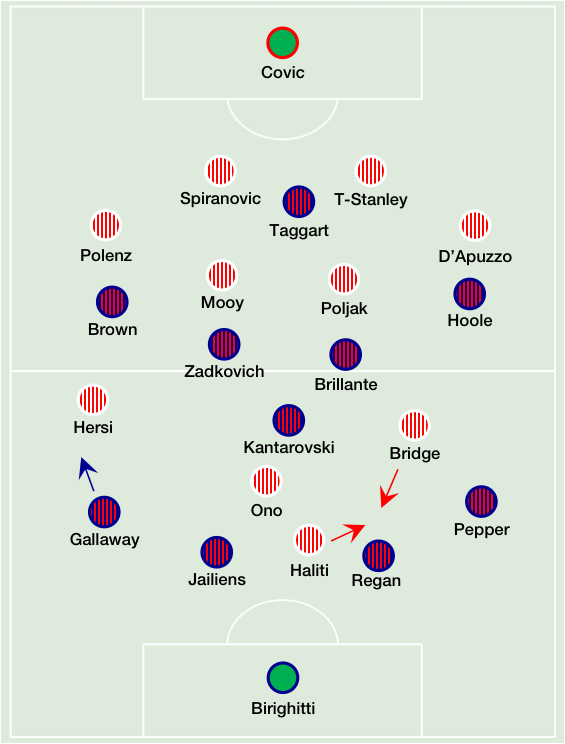 For all their early dominance, however, reflected in the contrast of passes completed in the opening twenty minutes, the Jets didn’t create many clearcut chances, and it felt inevitable that the Wanderers would eventually settle into the game. An important part of this ‘turning of the tide’ was the fact Mooy and Poljak both began to peel off their marker when the ball was played to them, so they had more time and space when receiving passes. Although it’s difficult to quantify this sort of thing, it was key, as it meant they could turn, face the attack and look to play balls into the feet of the attackers. 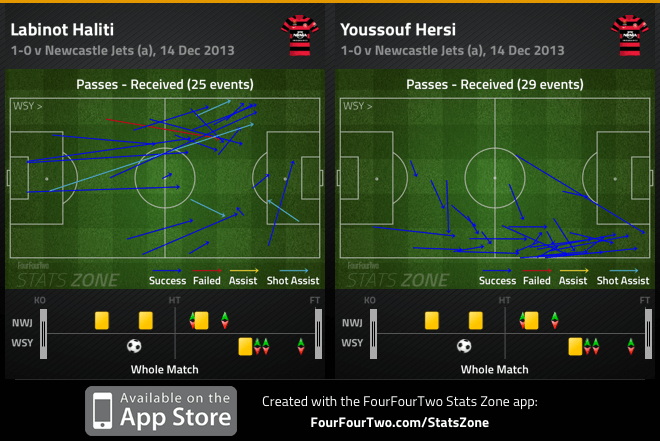 Meanwhile, a very interesting feature of their attacking setup was the positional rotation between Bridge and Haliti. The latter, starting as the central striker, particularly worked the left-hand side of the field and moved across to that flank to receive long balls. This, in turn, invited Bridge to dart inside into goalscoring positions – as he always does – and this caused problems for the Jets, with Bridge coming close early on with a driven strike, after Haliti had collected the ball on the left and cut a pass back across goal. Haliti also had a few opportunities to cut inside with the ball and shoot – he came close with a low, driving effort towards the near post. Hersi, by contrast, always kept right-sided width, as we’ve come to expect, although the Dutchman didn’t seem match fit and wasn’t as effective with his dribbling. Bridge scored just after the half-hour mark with a close-range header after Haliti had nodded an Ono cross back across the face of goal – rather ironically, it was the same combination (and a similar type of move) that had created the first goal in the last match between these two sides, when the Wanderers’ 3-0 win clinched the Premiership. Ono’s delivery was excellent, and from a pocket of space in the right channel, in the typical position he takes up when the centre is crowded. With the Jets packing their midfield with three athletic, defensively-minded players, it wasn’t surprising that he found it difficult to dictate the game, and was rarely involved in attacking moves – but it’s worth noting that the Jets seemed vulnerable to central players moving wide into the half-space between their central midfielders and wingers, with both Ono and Mooy swinging in dangerous crosses from this position. The latter’s ball in led to Bridge smashing the crossbar, while Ono’s created the goal. Van Egmond’s side now had to chase the game, and to give the manager credit, he was proactive with the use of his bench and brought on three fresh attackers. James Virgili was the first, replacing Brown in a straight swap that saw Hoole move across to the left. Later, on the hour mark, Michael Bridges and Craig Goodwin came on together in a double change for Ruben Zadkovich and Andrew Hoole. In pulling one of his three central midfielders, Van Egmond moved to 4-2-3-1, with Bridges tucked in behind Taggart. However, Newcastle’s attempts to chase the game (which dominated the pattern of the second half) were largely wing-based, with lots of passes forced down the sides and leading to inconsistent crosses. In this regard, Virgili’s willingness to take on defenders and drive to the byline proved useful, and he created a couple of half-chances. However, in reality, the Wanderers had the better chances to close out the game – naturally hitting the Jets on the counter, but also coming close from a couple of corners. Tony Popovic used his full complement of subs – after Van Egmond had played all his cards – but as three like-for-like changes, they had little impact on the flow of the game. The Jets have done well in recent weeks because of their switch to 4-3-3 – it brought an extra ball winner into the centre of midfield, and through pressure and winning the ball in that zone, and then springing forward quickly on the break, they’ve found success. However, this match showed that they’re still a reactive side, and naturally struggled when they had to break down a defence in chasing the game. Of course, they missed Nathan Burns – but this was a defeat of the system, rather than being down to the failings of any particular individual. Meanwhile, this was a standard Wanderers win – 1-0, which as Pete Smith at the Guardian pointed out, accounts for 41% of their results, and the lone goal coming through Mark Bridge, whose knack for goals (six in 11 against his former club alone) is impressive considering he starts from the left. The Jets seemed unable to cope with Haliti moving across to that flank and allowing Bridge to constantly cut inside.